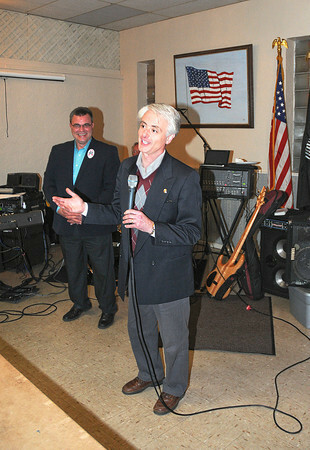 James Neiss/staff photographerNiagara Falls, NY - New York State Assembly 145th District candidate Robert M. Restaino, addresses supporters at the American Legion Frederick F. Cadille Post 1664. Restaino was leading in the polls with about 19 districts yet to come in. Niagara County Democratic Chair Nick Forester is all smiles at left.